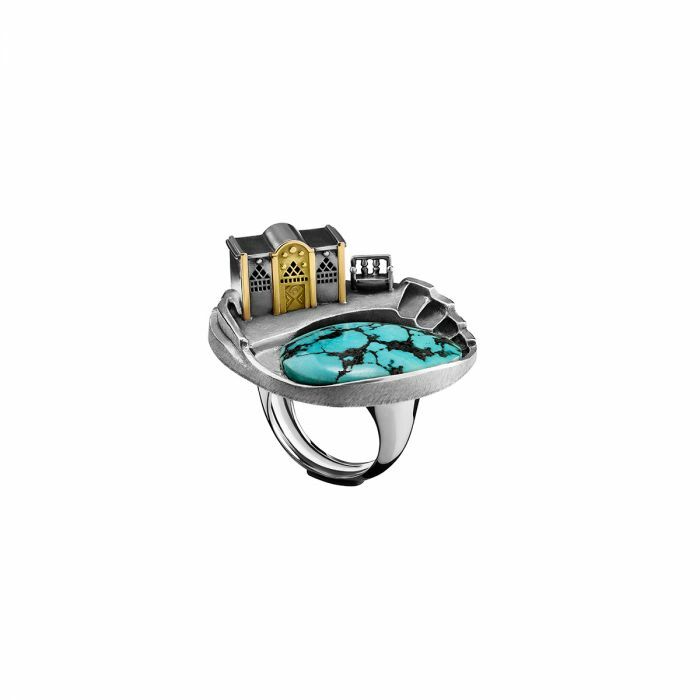 18kt Gold and Sterling Silver Limited Edition 3D Nubian Ring adorned with a 35ct Tibetan Turquoise stone and traditional motifs. A Limited Edition miniature sculpture - A traditonal Nubian house is brought to life, overlooking a striking Tibetan Turquoise stone Lake Nasser. A stairway leads to the house, which is sculpted in 18kt Gold and Sterling Silver, and presents the beauty of Nubian architecture in a new light - featuring its signature domes, dot motifs and crescents.